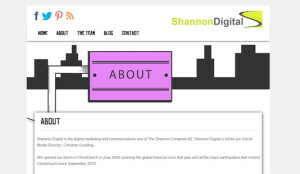 Shannon Digital is the digital marketing and communications arm of The Shannon Company NZ. Shannon Digital is led by Social Media Director, Christine Gooding. They opened their doors in Christchurch in June 2008. They do what they do for one simple reason- to make a positive difference. They work with key strategic partners in delivering the appropriate mix of digital media services for their customers on any strategy or campaign they are involved in. Helping people and companies to change their behavior for their own good and that of society. 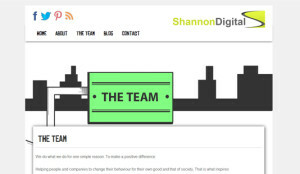 Christine and her team at The Shannon Company developed a realistic and targeted social media strategy for their new Shannon Digital website. We at DCGWS worked as a team to be able to help them make their own vision into a reality by creating a website through WordPress which includes adding plug-ins that are needed to convey their message appropriately. Because the client, The Shannon Company, already had an idea and a design they wanted, the team at DCGWS Internet Solutions only needed to create The Shannon Digital into a website through WordPress. With the collaboration of ideas and output of The Shannon Company and DCGWS, the Shannon Digital was made. The Shannon Digital has a very neat and unique looking website that is eye-catching to its audience.